Stylish, yet functional, wireless surround sound systems make an experience-enhancing addition to any TV-lover's home. Why? Well, while screen technology has (and continues to) evolve, sound seems to have been left behind, somewhat. Thin TV screens lack the space to incorporate the technology required to produce high quality sound, which makes purchasing surround sound speakers imperative for those who want to appreciate the full impact of their favourite film. Just as with other technologies, wireless solutions offer the greatest flexibility, without compromising sound quality. With this in mind, we’ve compiled a list of the best wireless surround sound systems, so you can gain a clearer idea on the kind of system that will suit your set-up. Find out more about how to build a home cinema room in our guide. Visit our technology and televisions hub pages for more comprehensive reviews, product recommendations and buying guides. Over the years, surround sound speakers have also had a 21st century revamp, making them sleek, smart and almost as statement as your television. Typically, surround sound speakers are purchased as a 5.1 set – that’s five speakers to one woofer, although there is the option to invest in more speakers if you require. The two front speakers may sit in the two corners of the room in front of your sofa and they typically carry the bulk of the track. The two rear speakers should sit behind your sofa, and provide an immersive sound experience. The centre speaker usually sits underneath your television and amplifies the dialogue in the track, separating speech out from the rest of the sound, which makes it clearer and easier to hear. The woofer can usually be placed anywhere in the lounge and provides bass and depth- it’s the speaker that makes the room vibrate if you turn the volume right up. However sometimes this can be different. For example, our first pick, the Beoplay A9, has all of these features piled into just one speaker, ideal for those who don't want several speakers dotted around the room but still want good quality sound. Surround sound speakers exist in three levels of size. Small living rooms will benefit from a compact surround sound system. The speakers are small enough to put on a shelf or on top of a cabinet, allowing to you maximise the space that you have. The next size up are bookshelf speakers - these typically require a mount or a stand and deliver a better sound quality than a compact surround sound set without being too obtrusive. Finally, there’s floor standing surround sound speakers, which are a feature in their own right and are best placed in large lounges where there’s plenty of space. Completely customisable to your space and taste, the Beoplay A9 doesn't only make a dramatic design statement, but it features built-in room adaptation to adjust the sound perfectly to its surroundings, so you experience honest, clean sound in any room. Choose from displaying on wooden legs (as above) or wall-mounting, and it's available in white, black, smoked oak or bronze tones (the covers are changeable so depending on the occasion or your mood, the opportunities are endless). Unlike other surround sound systems, the Beoplay A9 is so powerful that only one speaker is needed for sound to fill the room, ideal for those who are going for a minimalist look or don't like clutter. You can connect the speaker to your phone via Bluetooth, Airplay or Spotify, use the Bang & Olufsen app on your smartphone to control it remotely, or swipe or tap the Intuitive Touch Interface along the top of the system. Bang & Olufsen fans will be pleased to know the speaker features BeoLink Multiroom technology, allowing you to unite all your Beoplay products to play the same music in every room. A stellar product featuring a ground-breaking design, this is our pick of the very best surround sound speaker for your home. Browse more wireless surround sound speakers on Amazon. If you require a system that blends style with superior sound quality, this SONOS system may be the one for your lounge. It’s compact in design, and even the woofer has adopted a futuristic style beyond the typical speaker tower. SONOS say the system has been designed to provide a room with deep, clear Hi-Fi sound, so it’s great for giving your Spotify dinner playlist and television shows that cinematic boost. If you’re looking for an ultra techy system, the soundbar links up to your Amazon Echo too. While it won’t create the same cinema viewing experience as a floor standing set, for the size, there’s nothing to complain about, and the reviewers certainly agree – all great reasons why it deserves our number two spot. Take a look at the full range of wireless surround sound systems from John Lewis & Partners. 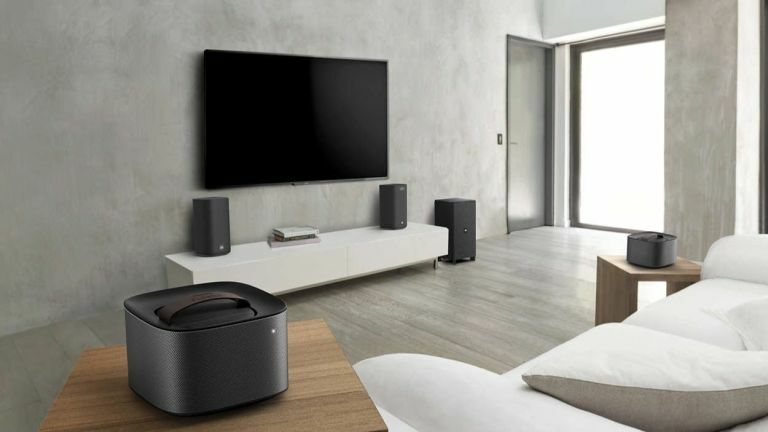 There’s no doubt that Bose are the giants of the sound universe, so it makes sense to put a wireless surround sound speaker set from this household name into our list. This surround sound speaker set has earned its position thanks to its low profile and promise of superior sound quality. With built in Wi-fi and Bluetooth connectivity, the soundbar can be used on its own to play your favourite Spotify playlist or part of the larger system. The speakers connect via Wi-Fi, so they’re incredibly easy to set up, too, and if you hate the sight of wires, this system is certainly just the ticket for you. In our opinion, these are the best wireless surround sound speakers for those who are looking for something easy to set up and use. Browse more wireless surround sound systems from Currys PC World. This speaker system promises immersive audio and thanks to the 4K pass through, superior quality sound. If you’re looking for a system that will allow you to link up to your phone and play different sounds in different rooms of the house, you can operate this system separately or as one. These are bookshelf speakers, so they’re best suited for medium and larger sized lounges and they’re going to need a mount or stand for display. Despite being Samsung,the system is fully compatible with both Android and iOS operating systems. Generally speaking, the smaller the speaker, the less powerful the sound. While our Bose and SONOS picks are great for smaller lounges or for those that don’t want their surround sound system to overshadow other features in the room, if you’re really looking for cinematic quality, you’re going to have to up your sizing. These speakers promise clear, crisp and well balanced sound without taking centre stage. With a traditional front and sleek, black body, their universally appealing appearance makes them suitable for any interior style. The best surround sound speaker system for those who are after compact cinematic sound. If you’re looking for a basic surround sound package that you can build on, this Yamaha soundbar and subwoofer package could fit the bill. The sound bar includes 17 internal speakers for enhanced dialogue, while the subwoofer is there to provide the depth of sound. Because the subwoofer is wireless, you won’t have to worry about where you place it. You can build on your system over time will other MusicCast products and eventually create a multi-room system where you can either play the same track or a different one through each speaker. Shop more wireless surround sound systems from PRC Direct. If your home is already filled with lots of gadgets, you’ll love this nifty surround sound system from Philips. First of all, each speaker unit is uniquely stylish, so the system will look great in any lounge. Secondly, two of the speakers and the subwoofer are detachable, portable, and can be controlled remotely through your mobile phone via the app and Spotify Connect or the controller included. The speakers have been designed to be freestanding and not too large, so they can be placed around the room without being obtrusive. Looking for more surround sound advice?